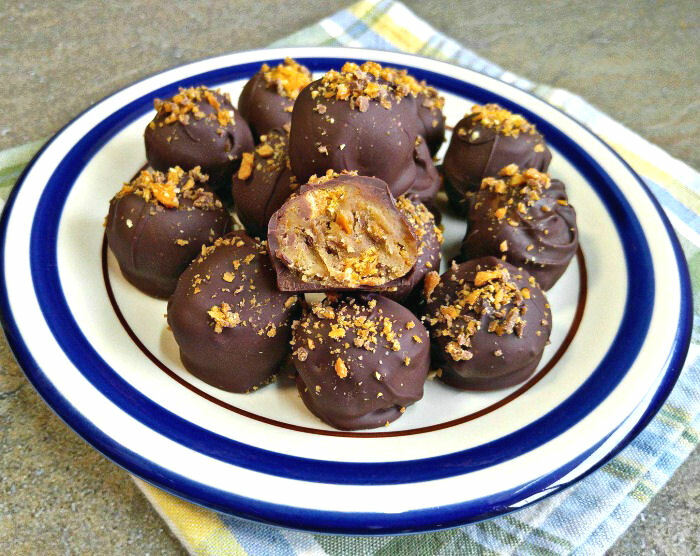 These Butterfinger truffles will be gone in a flash! One bite of these delicious chocolate bites, made with Butterfinger candy, will have you hooked. They are easy to make, and are both crunchy and creamy for a wonderful sweet treat that is sure to become of family favorite. For another great chocolate dessert, try these skinny dark chocolate cupcakes. No guilt and so dark and rich! And also check out these Red Velvet Cheesecake truffles. They are perfect for Valentine’s Day or Christmas. Truffles are a soft candy mixture that is covered with chocolate and flavored with various tastes. Often a truffle has a rum flavoring but this is not a requirement. The main feature of a truffle is that it is a bite sized confectionery. They are often served at parties. With today’s plethora of food sites online, truffles have taken on a life of their own with many different flavorings, coatings and toppings. I love to make truffles. They are super easy to put together and the bite size keeps the calories lower than a bigger snack would have. They are really popular at parties, and I am always experimenting with new flavors to serve my guests. 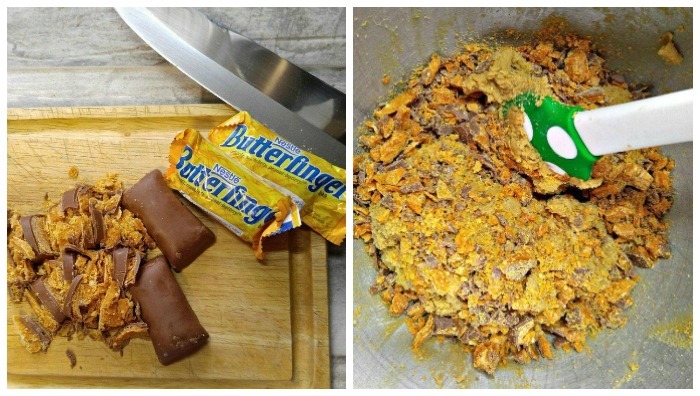 I was cleaning out my cooking supplies the other day and found a bag of bites sized Butterfinger bars that needed using. 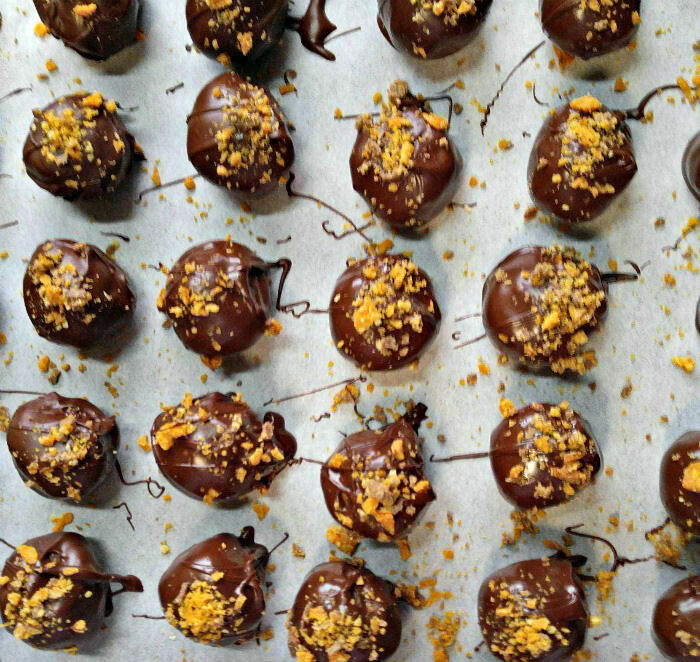 These Butterfinger truffles are the perfect way to incorporate the peanuty flavor of the bars, as well as their crunch into a tasty chocolate covered ball of goodness. This post contains affiliate links for your cooking convenience. 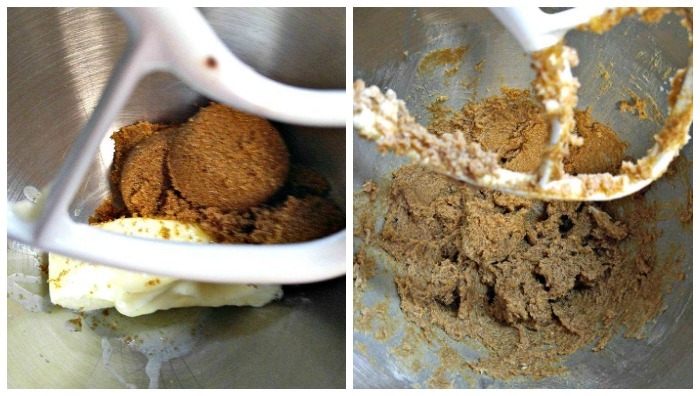 Start by creaming your butter and brown sugar in the bowl of a stand mixer. Add in the pure vanilla extract, sea salt and milk and cream again until you get a nice thick consistency. 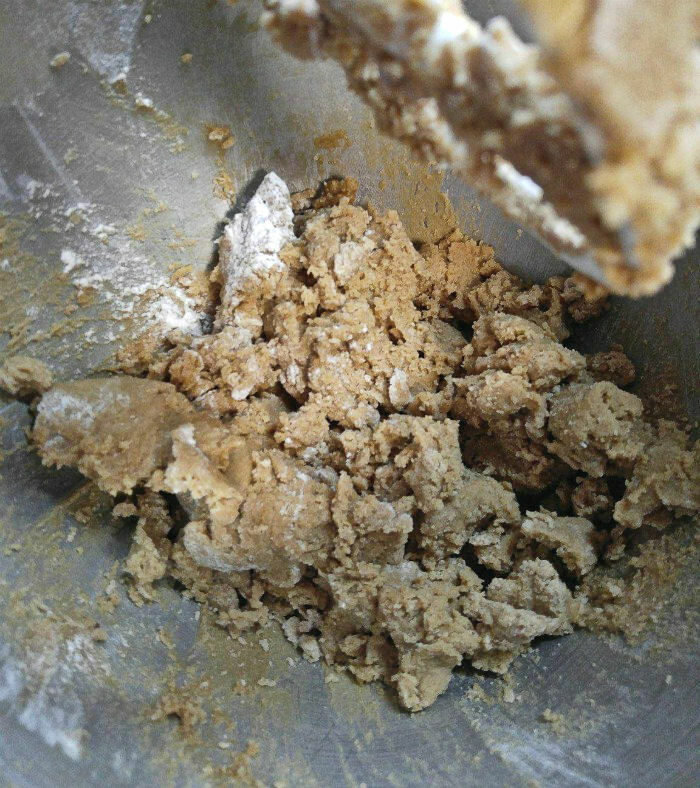 All purpose flour helps to hold the mixture together. Just gradually add it to the mixing bowl until you have a very thick dough. Next comes the Butterfinger bars. I used 7 of them and crushed them with a chef’s knife. I folded the crushed candy into the stiff dough. Who’s ready to make some chocolate bites with Butterfinger candy? I found it helpful to place my dough on some parchment paper and form it into a log. I cut it in half and then cut each piece again until I had 36 squares of dough. Place the whole baking sheet into the freezer for about 15 minutes. This helps the balls set and they will hold their shape better when you get ready to dip them. Combine the chocolate chips and 1 teaspoon of coconut oil together in a microwave safe bowl. Heat it in 20 second increments until the chocolate is smooth and silky. I used a candy dipping tool to dip the balls of dough. 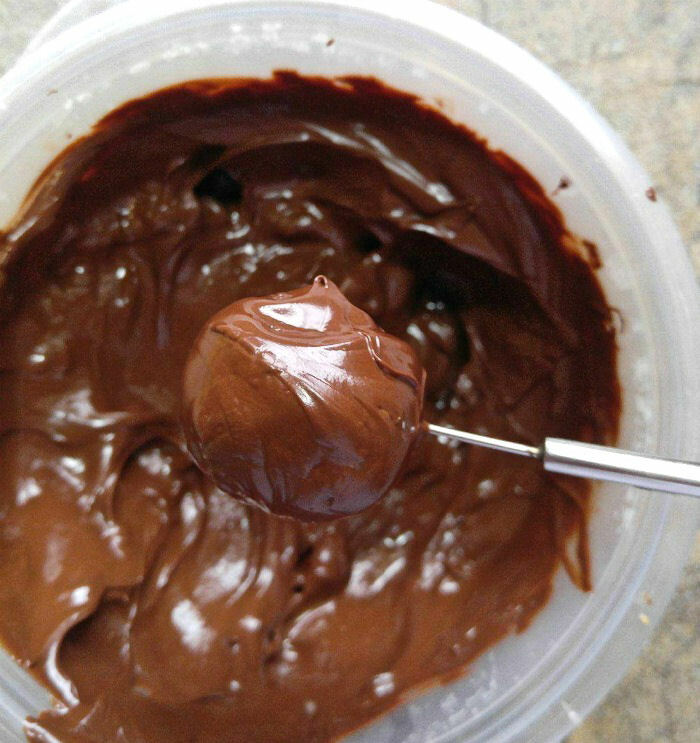 The little ladle holds the ball and allows the excess chocolate to dip away. Add a few sprinkles of the chopped Butterfinger bars on the top of the truffles to decorate. I found that doing about 4 or 5 at a time worked best since the chocolate sets quickly if you do too many at once. These delicious chocolate bites have a creamy center with a bit of crunch from the crushed Butterfinger candy. The dark chocolate is rich and decadent. All together? One amazing bite of deliciousness! These delicious truffles keep best when stored in an air tight container in the fridge. They will keep about a week, IF they last that long! 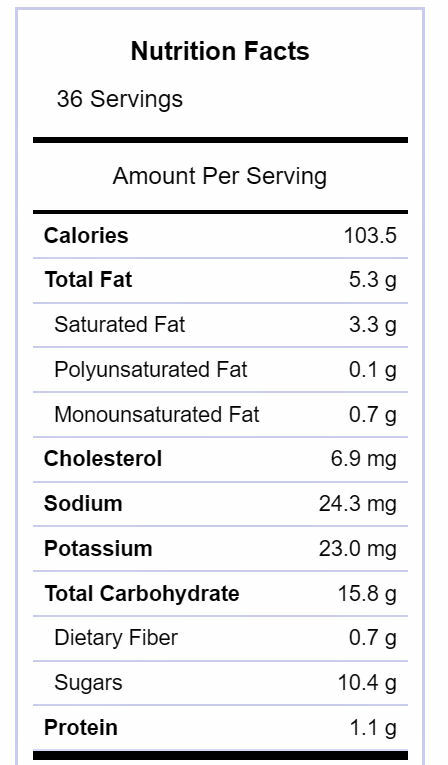 Each tasty truffle works out at about 103 calories. But I challenge you to eat just one! 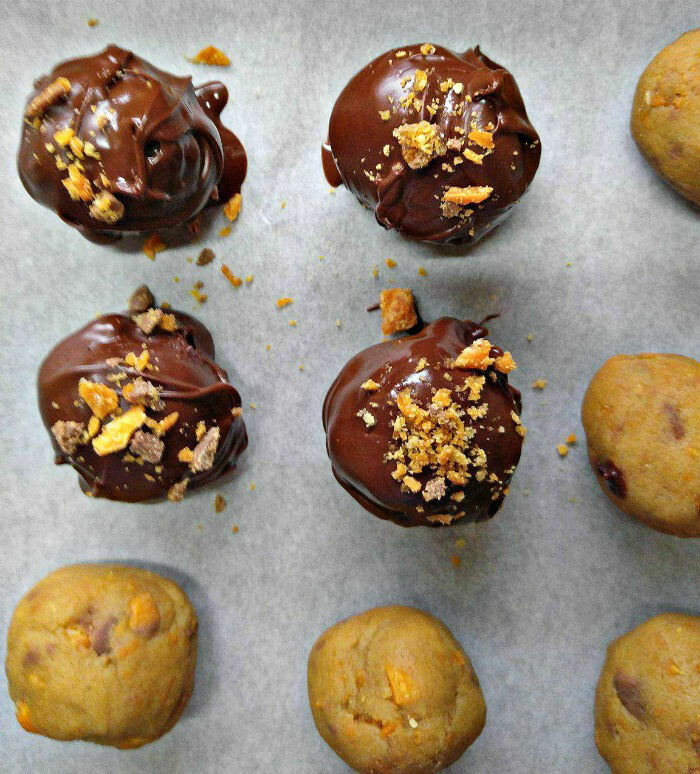 These butterfinger truffles will be gone in a flash. The delicious chocolate bites are made with butterfinger candy for a crunchy sweet treat that is sure to be a holiday favorite. In the bowl of a stand mixer, cream together the butter and sugar. Mix in the the vanilla, salt, and milk and cream the mixture again. Roll the dough into 35 balls about 1" in size. 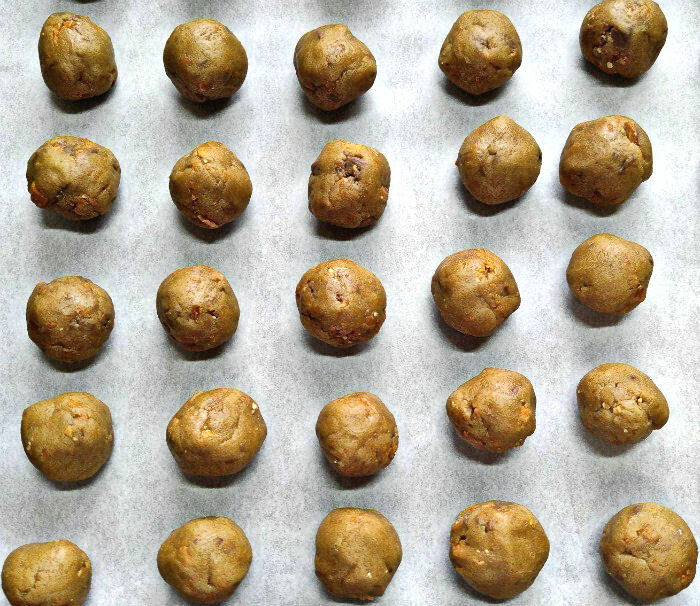 Place in the freezer for about 15 minutes to make the balls easier to dip. Melt the chocolate chips and coconut oil in the microwave in 20 second increments until smooth. Dip the truffles into the chocolate. Place on parchment paper and top with the crushed Butterfinger candy. Allow to set. Going to try these soon!